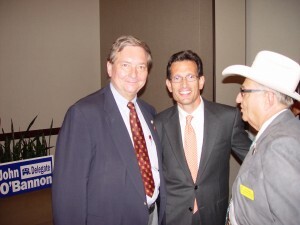 Delegate John O'Bannon Fundraiser Features Special Guest Congressman Eric Cantor | Virginia Right! Virginia House Delegate John O’Bannon MD (R-73rd) held a fundraiser yesterday at the Westin Hotel on West Broad St. in Richmond. This was a star studded event that was attended by a number of Virginia political figures from around the state with special guest Eric Cantor. 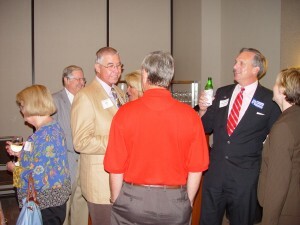 There were over 100 supporters who attended the event to aid Delegate O’Bannon in his reelection bid. Doctor O’Bannon, a renowned neurologist is the only doctor currently elected to the Virginia House. As such, his expertise and input is invaluable to the Virginia lawmaking process. It is imperative the we keep O’Bannon in the House especially in light of the changes the Democrats in D.C. are trying to slam through. Virginia has benefited from this expertise since 2000, and we all need to make sure our Doctor in the House continues to serve. 7th District Republican Chairman Linwood Cobb got the evening started and presented a check from the 7th district to John O’Bannon. Dr. O’Bannon delivered a positive message reflecting on his years in the House and his desire to continue serving the district he so fondly calls home. Congressman Eric Cantor closed out the evening with a message on how the climate in the nation has changed. He noted the difference in the energy and excitement in the Republican Party over the last 8 months. Congressman Cantor talked about the parallels of this year and 1993 when George Allen took the State’s highest office and the following year, Newt Gingrich and the Contract for America swept the nation. It will take a lot of hard work, but things are lining up in favor of the Republicans in Virginia this year, and hopefully this will carry through to the next Republican revolution in 2010. Please visit Delegate John O’Bannon’s website by clicking the link. You can find additional information on one of our most effective legislators and request information, yard signs or bumper stickers, and other items as well. And Dr. O’Bannon is always glad to have people volunteer to help with his reelection bid. They are out knocking doors and calling voters to find out how he can best serve you. Great event! So good to see so many energized Republicans! Keep up the good work Dr. O'Bannon! Election season is definitely here!